It’s been a long time since I’ve posted here. Time has a way of going quickly when you are busy doing things that you love. As I approach the end of my fifth year of post-corporate life, I continue to be amazed at the lack of white space on my calendar. There are always upcoming events to train for, the actual events to experience, and then the very brief period of rest and recovery before ramping up for the next one. The year 2016 has been a stampede of events upon events. Looking ahead, I expect 2017 to be even busier! When I last wrote, CFL and I were training for Seattle to Portland (STP), a two-day, 206-mile bike ride. We’d never done a century ride before, much less two of them back to back. While we were among the slower riders in the throng of 10,000 cyclists, we got it done. We even managed to have some fun along the way. We were all smiles at the start! Enjoying a few miles of off-highway riding on a very nice bike trail. At a food stop on Day 2, in front of the “World’s Largest Egg” in Winlock, WA. 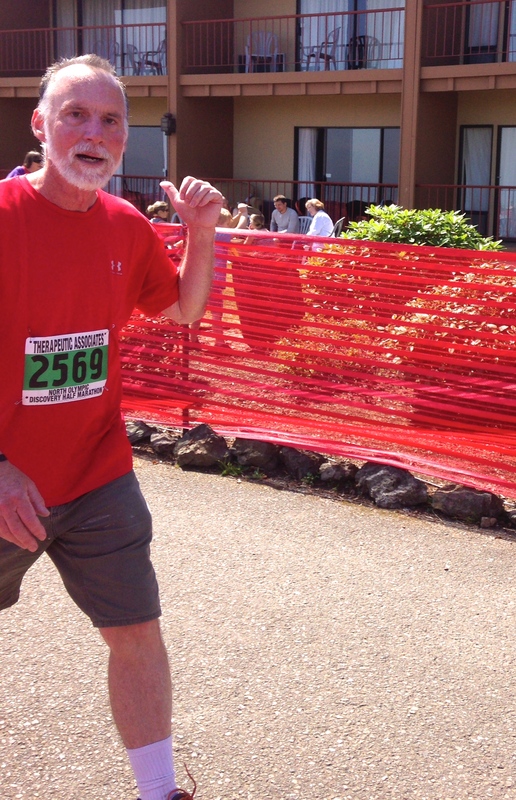 My triumphant arrival at the finish line! We’d barely had time to recover from STP when we were off for our second Ride Around Washington. Last year’s ride had taken us from Ilwaco on the Washington coast, approximately 400 miles to Walla Walla in eastern Washington. This year our group of 250 cyclists returned to Walla Walla and then rode another 400 miles all the way up to tiny Metaline Falls in the far northeast corner of Washington state. Our ride took us through the rolling hills of the Palouse. We crossed over into Idaho a couple of times. Coming out of Lewiston we rode the historic Spiral Highway, which winds up 2,000 feet in eight miles. Such fun on a 95 degree day! On our last day we crossed the Pend Oreille River on this beautiful bridge. Although it looked scary, it wasn’t. I stopped to look directly down through the open grate at the river below. We were happy to see this sign at last. 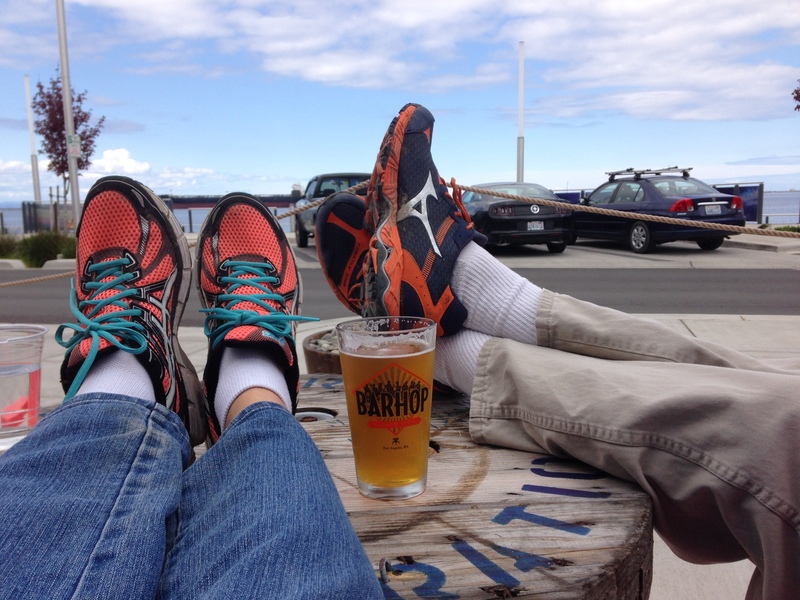 Finish line beers are the best beers! Overall, it was a wonderful ride. I managed to complete it without injury (unlike last year) or any significant aches or pains. We relaxed and took our time, and still managed to find time for an ice cream stop most afternoons. 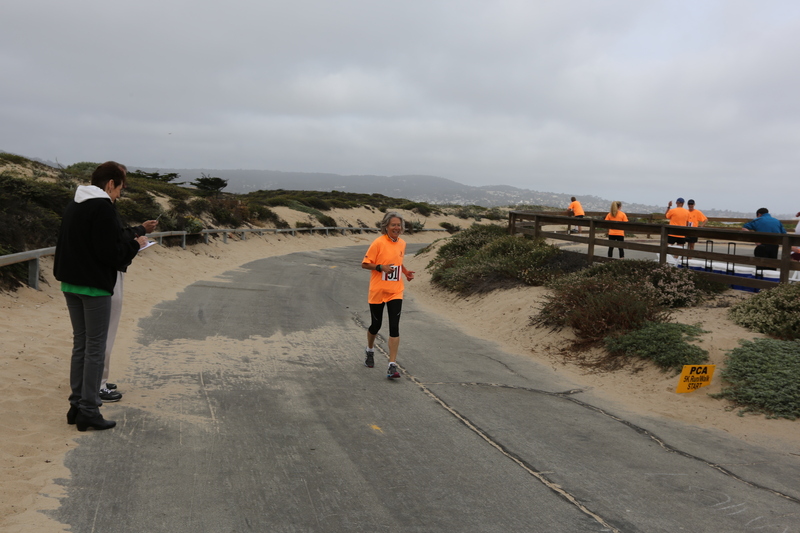 A mere week after returning from RAW, I tried something new — I competed in my first duathlon! I’ll never do a triathlon because I refuse to get in the water, but the idea of run-bike-run has always appealed to me. When a local duathlon was announced, of course I had to register. The course was a 5K run through a county park, followed by a 21.5 mile bike ride (two laps of rolling country roads), and finally by the same 5K run again. Although I’ve done run-bike for fun several times, I only had one chance to practice run-bike-run before the event. I was totally mystified as to how the Transition area would work, but the friendly volunteers provided helpful tips on how to stage my bike and where to go as I finished one phase and moved on to the next. I had no idea how much time I’d need during the two transitions. Therefore I had no idea how long the entire event would take me, but I roughly estimated I could do it in under 2:45:00. Although it was mid-August, it was a cold, foggy morning. This made the first 5K easy enough. I shivered at the starting line, grateful for my arm warmers (sleeves). 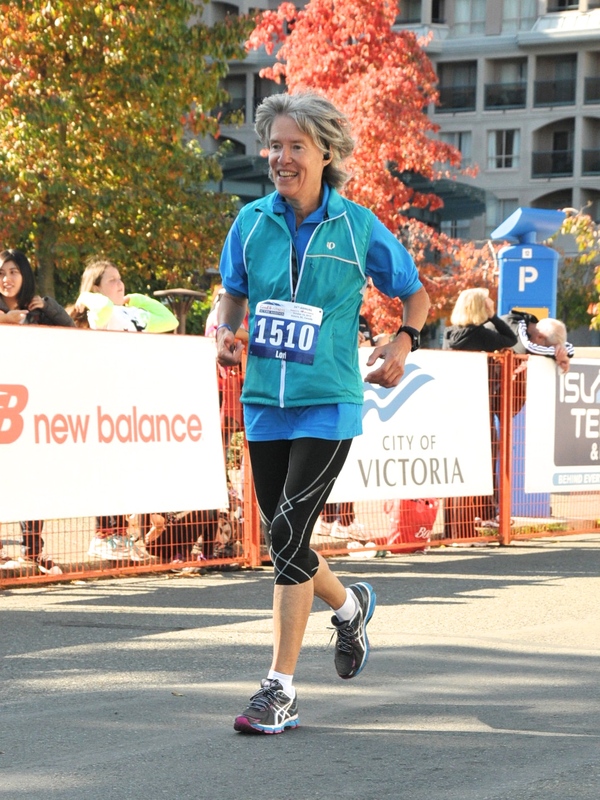 Then off we went — me at my usual slow, happy pace near the back of the pack. Finishing the first 5K, I ran through the chute and found my way back to my bike. As I’m a wimp who doesn’t yet clip into my bike, I didn’t have to worry about changing my shoes. I simply removed my helmet, took a quick swig of water, and then I was on my way. Arm warmers are pushed down now! Although it was still foggy, I was well warmed up. I’ve never raced a bike before, and I really had no idea how fast I might complete the 21.5 miles. It turned out that I can ride quickly enough when I’m motivated. I made up a lot of time on this section of the event. Coming from a run to the bike, my legs do just fine, but going from the bike back to running is a lot harder. I sort of stumbled through the second transition, but I stashed my bike safely and found my way back out on the course. I ran the second 5K a minute faster than the first one, even though I walked up the one big hill. Another triumphant (if slightly bedraggled) finish line arrival! My finish time of 2:33:02 was good enough to finish 20th out of a field of 39 — not bad for my first duathlon! I’m now totally hooked and I can’t wait to do another one. After mid-August, things got a lot quieter. I was training for a half marathon to be run in early November, but a nasty bout of shingles in October ended my racing plans for the year. Since my recovery from that, I’ve resumed running and riding but without any particular goal in mind other than daily mileage. So now we’ve cycled through the seasons and found our way to late December. Our calendar is filling up with big plans for next year, but that will have to wait for another post. It has been much too long since I last blogged here! As usual, I have a good excuse: I’ve been too busy living to write. So what have I been up to? Instead of trying to write about it all at this point, it might be easier to show you. We had a short, if occasionally dramatic, winter. 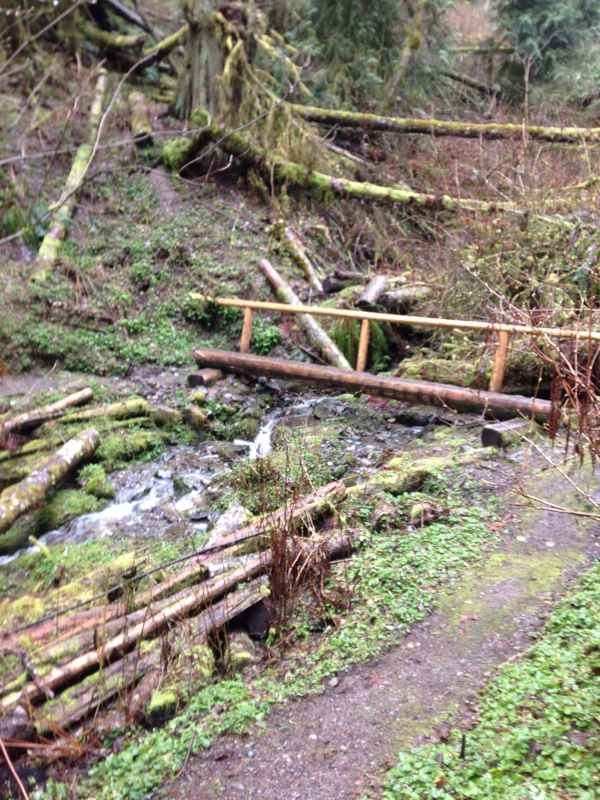 A series of large rainstorms in February did major damage to our Olympic Discovery Trail. The mudslides have long ago been cleared from the waterfront section, but the big bridge across the Dungeness River is still closed. The river has permanently (well, for the foreseeable future) changed course, and the whole western side of the bridge will need to be rebuilt. 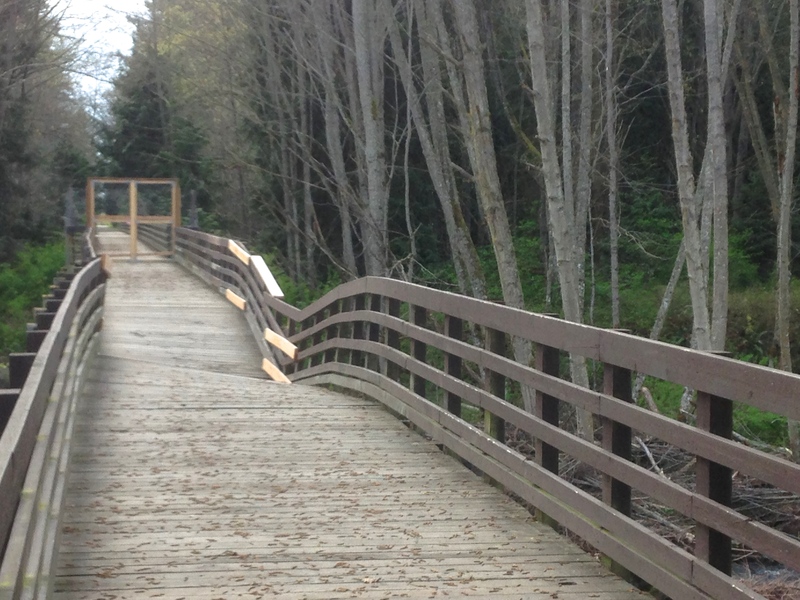 It’s possible to detour around this section of the trail by road, but it does make long bike rides a bit more complicated. 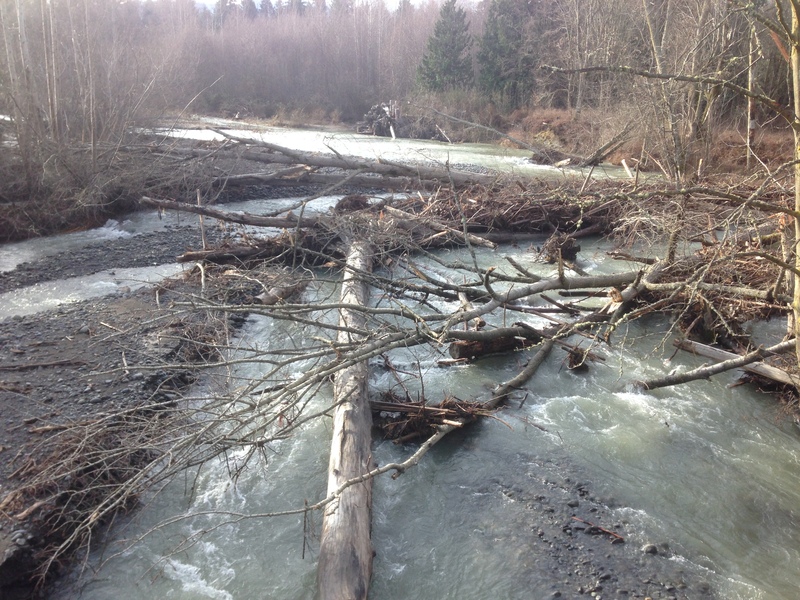 To the west, the Elwha River is finally running clear again after the historic removal of the two large dams. It’s great to see that pure blue-green water! 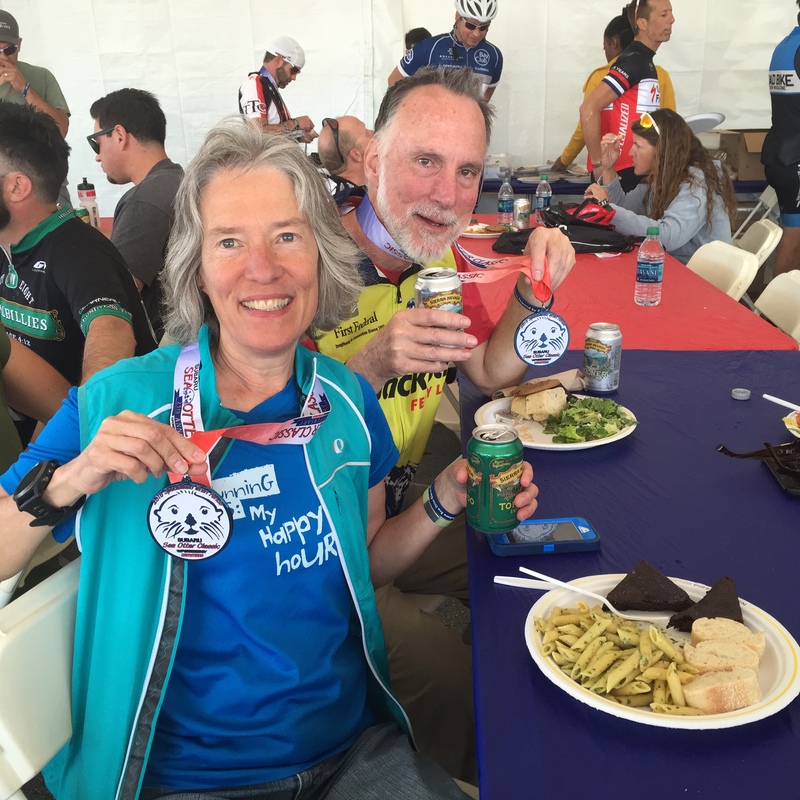 In April we drove down to Monterey, California to ride the Sea Otter Gran Fondo. The Sea Otter Classic is one of the largest competitive bike events in the country, and the Gran Fondo is one of the few non-competitive events included in it. We rode 51 miles of the beautiful coast of Monterey and Pacific Grove. We were having so much fun riding that I never took any photos along the route! But here we are enjoying the lunch afterward. 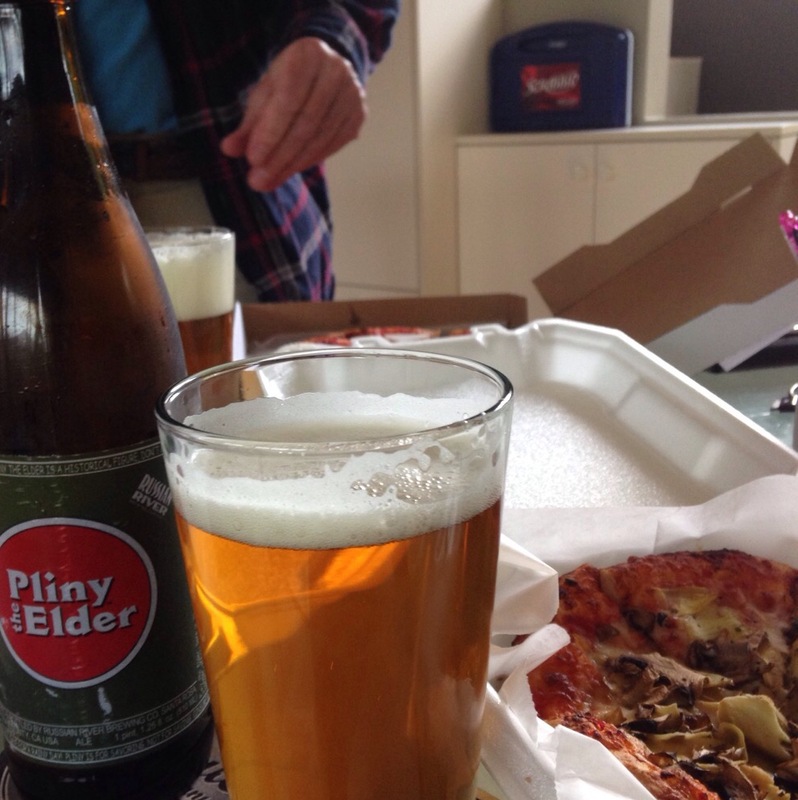 We came home with 24 bottles of Pliny the Elder, which we happily shared with several of our friends. Meanwhile, Port Angeles has been in the news. 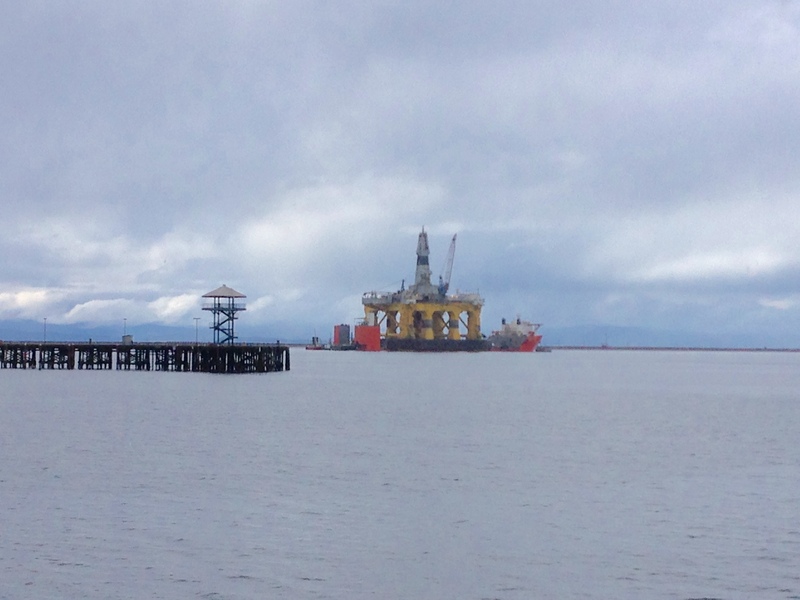 You may have heard about the Polar Pioneer, a large off-shore oil rig that Shell wants to deploy in the Arctic. It was moored in our harbor for nearly a month before making its way to Seattle, where it was greeted by hundreds of protestors. We didn’t like it being here either, so it was a relief to see it go, even though each move puts it that much closer to its intended destination. It is huge! At over 400 feet tall, it was the largest thing in view from everywhere in town, but especially imposing viewed from right on the waterfront. We’ve been so busy we’ve hardly had time to brew beer, but we’ve gotten a few batches done. Meanwhile I’ve judged several times and have now been promoted to Certified rank. I was also asked to judge at a commercial competition, the Washington Beer Awards, where I judged mostly robust porters and barleywines. It was a real honor to participate, and I can’t wait for the results to be announced so I can find out who brewed those tasty beers that my team judged! This past weekend I ran another half marathon, and earned another PR on a very warm day. You can read more about that here. Yesterday I celebrated my half marathon with an easy hike. 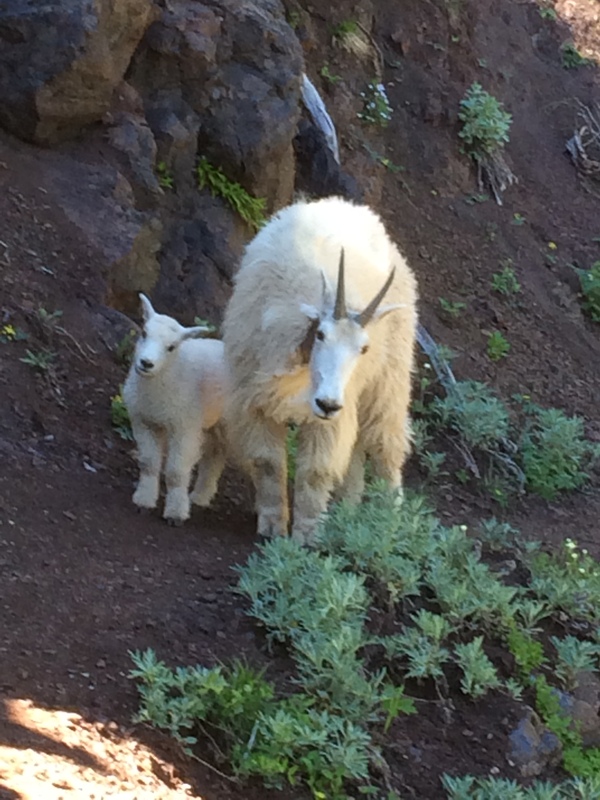 We had a destination in mind, but we turned around early when we met up with this mother and baby. We could have just shooed them off and hiked on. The Park management wants hikers to shout and throw rocks to discourage them from approaching people. But we could see and hear other hikers shouting just a bit further up the trail, so we knew there were several goats and that some of them were refusing to budge. Soooo, it was time for us to go. And it’s time for me to go now too. I haven’t ridden my bike since a couple of days before the half marathon. It’s time to get out there and enjoy this beautiful day! 2015 — off to a great start! I wrapped up 2014 with a total of 3,167.60 combined running/biking/hiking/walking miles — which was 1,002 miles further than I did in 2013! By the end of November I’d logged 2,865.55 miles. As December began I started thinking about “1,000 miles further than last year” and wondering whether I could do it. Then we had some very cold, icy days and I wasn’t enthusiastic about going out just to ring up the mileage. Fortunately my treadmill and my bike trainer made it possible to do 10+ miles a day without having to set foot outside the door. I dreamed up this routine that I called “30/30.” I start with 3.1 miles on the treadmill (which I can do in just about 30 minutes). I catch my breath for a few moments, then I jump on the bike trainer for 30 minutes (during which I’ll usually ride the equivalent of about 7.5 miles). 30/30 = 60 minutes = 10+ miles. Then I’m off to the shower and I’ve earned the right to sit and read for the rest of the afternoon. 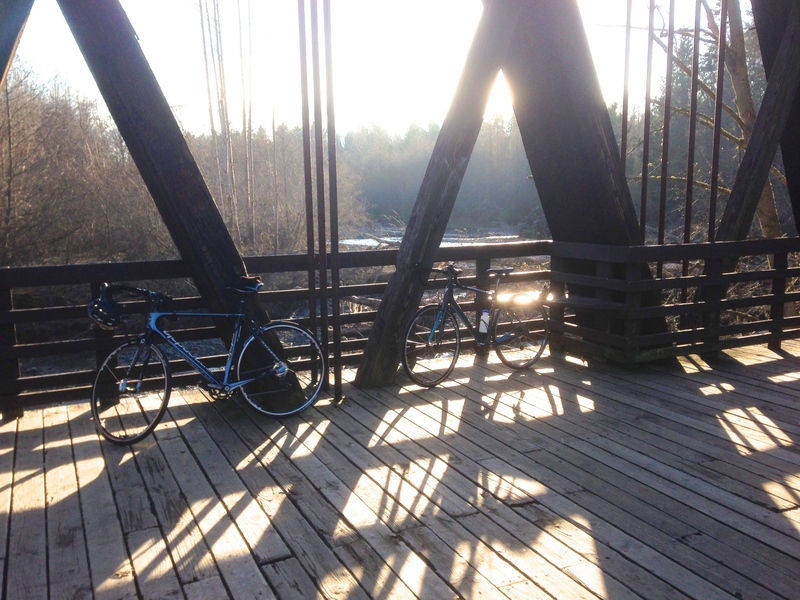 We had some nice weather between Christmas and New Year’s and I was able to get in some bike rides in the real world. Between the bike rides and iterations of 30/30, I covered 86 miles in the last week of the year and met that seemingly impossible goal. Given that in 2015 I’ll be training for a full marathon and also planning to do a lot more bike riding, I’m thinking it should not be too difficult to do a total of 3,600 miles in 2015. 300 miles a month sounds doable, right? CFL just bought himself a new road bike. We started 2015 off right with a 23-miler on New Year’s Day! The Dungeness River was still flowing high from all the recent rains. Lots of big trees were down. 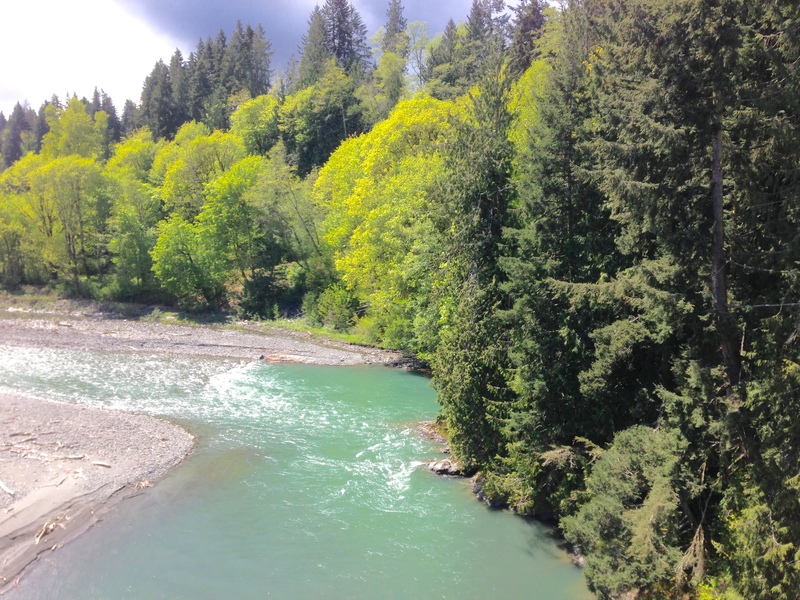 Today we think we’ll ride the other direction, out to the Elwha, to check on the condition of that river! What about you? What are your big plans for 2015? So many wonderful moments, such a grand life! I usually focus on the upbeat in this blog. With a title like Slow Happy Living, that’s to be expected. But life is lived in moments, and not all moments are happy ones. My father passed away last week, one week after his 87th birthday. Per his wishes, there will be no service. I would like to write something by way of a eulogy but the task may be too big for me, at least for now. So I’ll just reflect a bit on his life. His passing was not unexpected. He’d had a stroke several years ago from which he’d largely recovered. A second stroke this February was more debilitating, but he had come home and was adjusting to the use of a walker or wheelchair. He insisted that he surely would drive again soon and that he and my step-mom would take one more vacation together. Yet he worried constantly about the next stroke that he was sure would come. The third stroke in late March was massive. He could still speak, but he was confused. He could do almost nothing without assistance. There would be no coming home from the nursing home this time. Although doctors said he might live for several more years, he never talked again about his plans for the future. Last week he suddenly developed complications from that stroke. CFL, my daughter, and I made a quick trip south to see him. He recognized and acknowledged us. The next day he slipped into a sleep that took him away peacefully early the following morning. My father was a proud yet humble man, a Depression-era stoic with a sometimes-difficult childhood home life. Although he attended school sporadically through the first year of high school, he told me late in his life that he’d really only had a 4th grade education. Despite his lack of formal education, he became a scientific glassblower, a man so highly skilled in his craft that engineers struggled to design a bulb-blowing machine that could approximate the intricacy and precision of the work he did by hand. Among other accomplishments, he made a glass sensor that went into the lunar astronauts’ backpacks. Those packs were left behind when the astronauts returned to Earth. My dad’s glass sensors are still up there on the Moon. The Moon is an appropriate home for my dad’s glasswork. He was fascinated by astronomy and used to talk to my brothers and me about the vastness of the universe. He, who had no use for institutional spirituality, made the scientific idea of infinity meaningful for me. When I contemplate the stars I hear his voice. He had an abundant curiosity and an amazing memory for facts and data, places and times. He did long division in his head. He pored over maps. He kept records of every gallon of gasoline he put into every one of our cars. My dad loved to travel; we took regular Sunday drives to the mountains and deserts of southern California. We hiked. We camped. We collected interesting rocks. We climbed Mt. San Antonio (Mt. Baldy), the highest peak of the San Gabriel Mountains at 10,068 feet, when I was about 9 years old. While my friends’ vacations consisted of holiday visits to grandparents, we took epic summer vacations to National Parks. He took movies, which always seemed to start with a shot of his nose as he peered into the camera lens — if they had been sound movies, you would have heard, “Is this thing on?” Why he never figured that out, I have no idea. He was active well into middle age. He used to get us up early for Sunday morning bike rides before breakfast. There were no bike paths in those days; we’d whizz around on empty boulevards while others were still sleeping. He rode 40 miles on his 40th birthday and vowed he’d continue that tradition through the years. He rode regularly until his early 60s when my mom was diagnosed with lung cancer; then he put the bike away and stayed close by her side. My mom and he took one or two more short vacations before she became too sick to travel. After she died he tried to start riding again, but found it difficult. He was in his mid-60s, and he was no longer comfortable out on his road bike. When he met my step-mom, he became young and energized again. It was so good to see him smiling! They traveled all over the world together, up until just a few years ago. I am so grateful that she came into his life and made his last 21 years such happy ones. Every family has its dynamics, and my dad was not perfect. But he taught me to love learning, to see beauty in nature, and to enjoy experiences more than things. With my dad’s passing, I suddenly find myself on the cusp. My generation is next in line to go. I have reached that moment when I suddenly look around, see myself in a mirror, and finally, fully understand that I am no longer young. CFL and I vow to stay active for as many years as we can, while knowing that someday we too will decline and fade. What we have now are moments, and we can only strive to make the most of each of them. 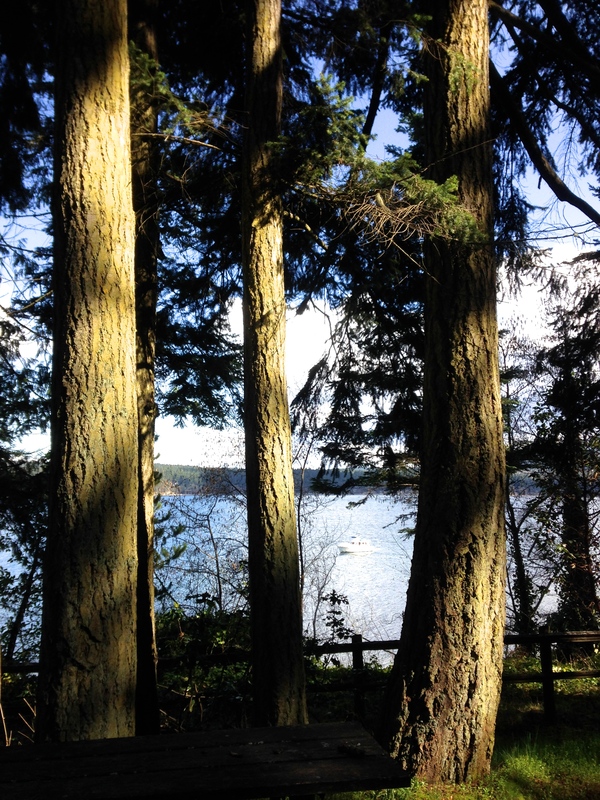 Yesterday I went out for a long run along the waterfront trail. As it happened, I was out there just as 250 cyclists from the Cascade Bike Club’s annual Ride Around Washington (RAW) were coming through on their tour. I was proud to share “my” trail with these riders. I thought about how thrilled my dad would have been to ride with them. Just as long runs did for me after Kurt died, yesterday’s long run invited and created a safe place for cleansing, healing tears. Dad, I’ll miss you. You were the best! Now I’m going for a bike ride. 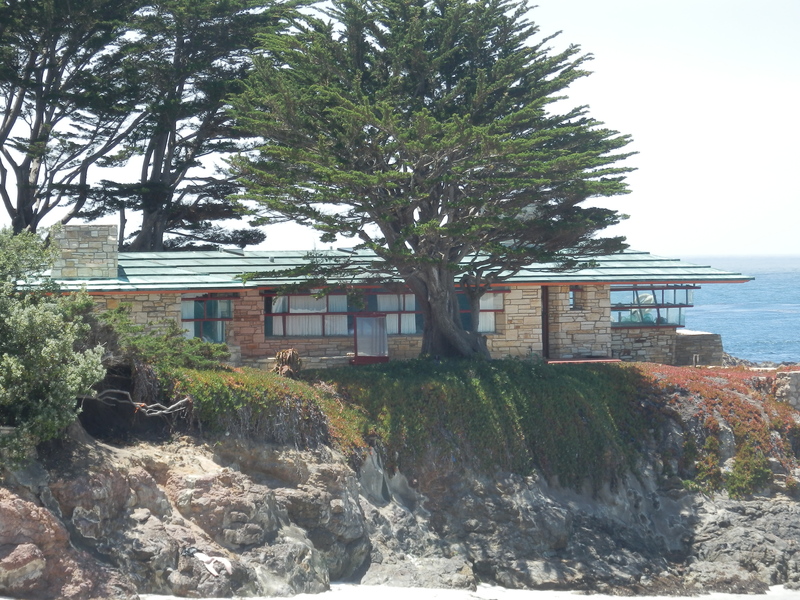 Monterey, California was my late husband’s favorite place in the world. We would have moved there years ago if we could have found suitable employment to manage the high cost of housing. Alas, that never happened, so we chose Port Angeles, WA — a decision I never regretted — but his heart always longed for Monterey. Beginning in 1988 (I think?) we went there nearly every August for the Historic Races. 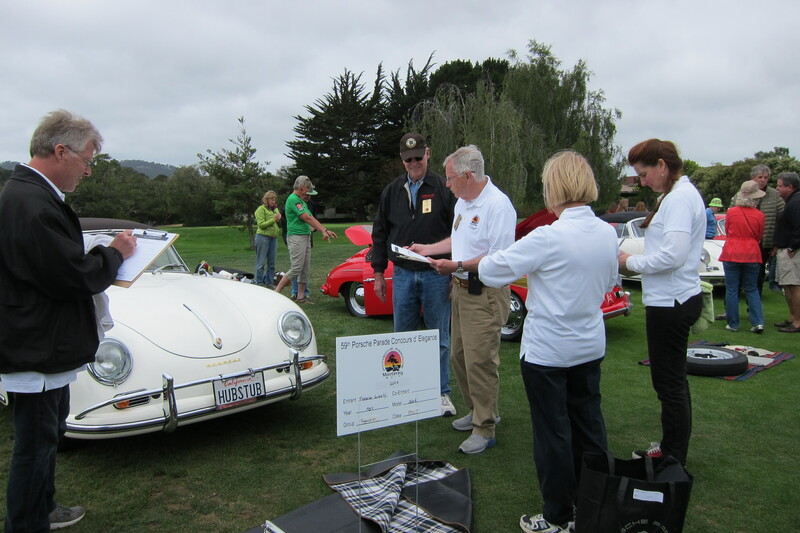 We also attended several Porsche Club events in Monterey. The Monterey Porsche Parade in 1990 was always his favorite of the ten Parades we attended together. A few months after he died, I drove solo down to southern California and burst into tears when I saw highway signs pointing toward Monterey. I wrote about that moment here. Three years seems so long ago now, but at the time I didn’t know when I’d ever be able to return to Monterey without feeling that pain. 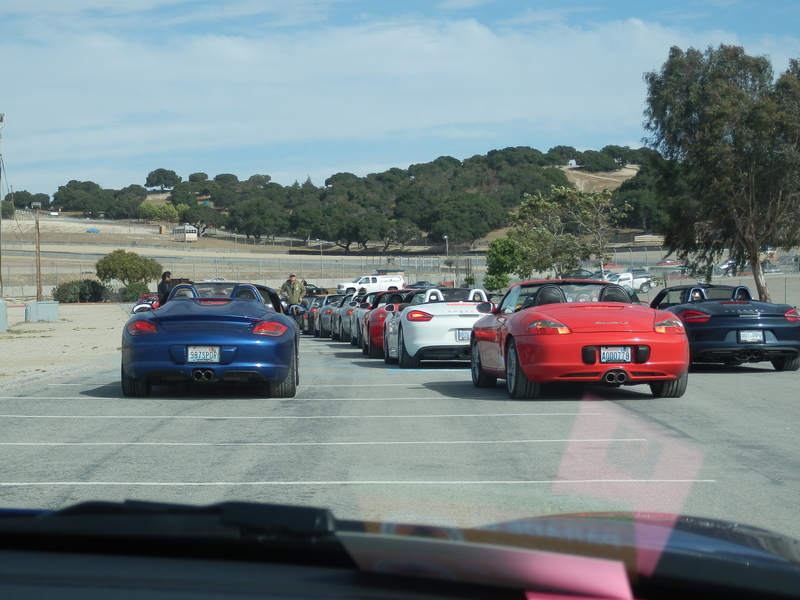 So I felt a mixture of delight and trepidation when it was announced that the 2014 Porsche Parade would be held in Monterey. I knew that I would go, but I didn’t know how I’d feel about being there. As it turned out, CFL is now an important part of my life… and Monterey is a special place for him also. He actually lived there for a few years as a very young child while his father was stationed at the Naval Postgraduate School. 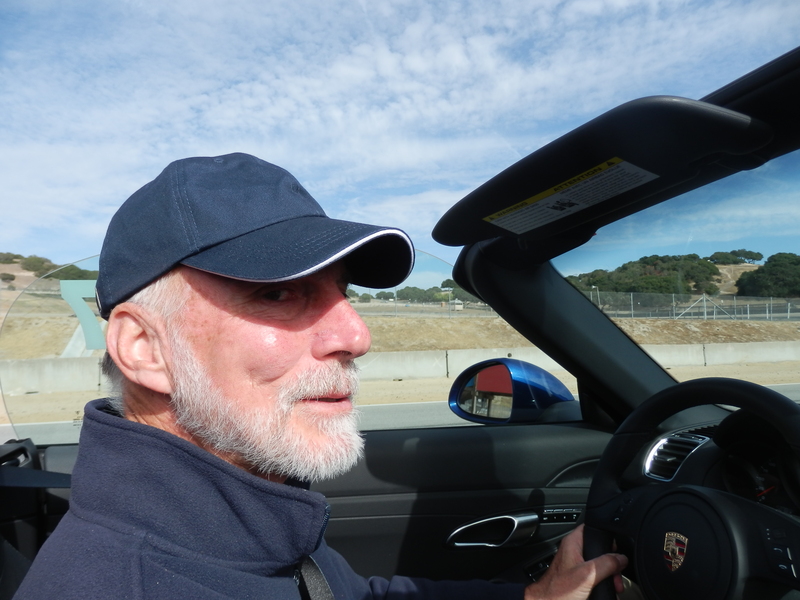 The Porsche Club of America is, I believe, the largest single-marque car club in the world, with over 100,000 members in 139 regions across the US and Canada. I’ve been a member since 1986, and yes I have owned a few Porsches over the years. The Parade is an annual national gathering held in a different city each year. 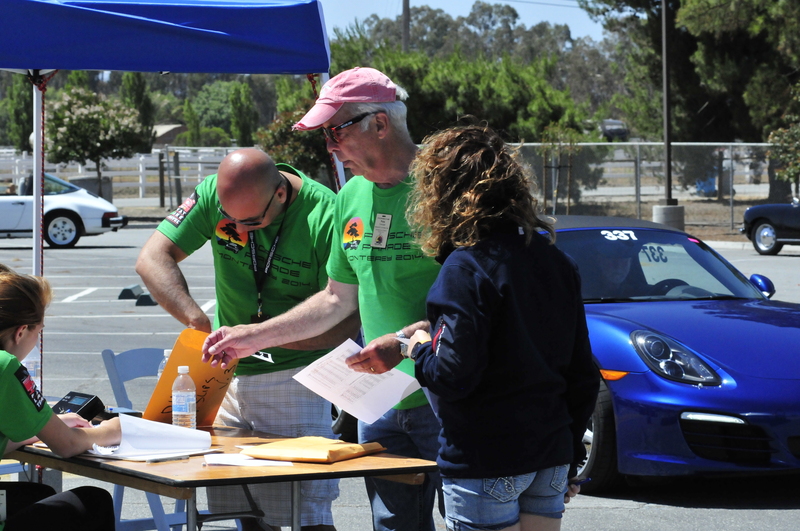 During the week-long event, participants can choose from car-related competitive (concours, time/speed/distance rally, gimmick rally, autocross, technical quiz), other competitive (art show, golf tournament, 5K run, radio-controlled car races) and social (driving tours, banquets, receptions, beer tasting, wine tasting) events. It’s a busy week! This year’s Parade was the largest ever, with more than 1,200 entrants (representing approximately 2,500 people and 1,000+ cars in attendance). As it was my 11th Parade and CFL’s first, I was delighted to “show him the ropes” and introduce him to many old friends from all over the country. Here is our team in action, as each judge was filling out his/her scoring sheet (as lowly workers, we didn’t get into this photo). Our debut as competitors was the time/speed/distance (TSD) rally. 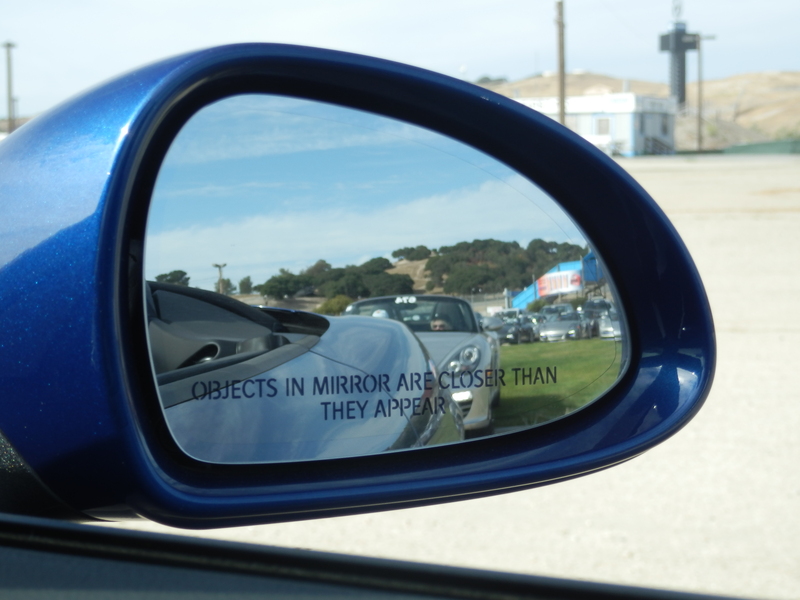 The object of a TSD rally is to (1) stay on course and (2) arrive at each checkpoint at the right time. My late husband and I had gotten rather good at this over the years; our best finish was a 2nd in class (against 200+ others) in San Diego in 2007. As rally driver, CFL rose to the challenge and did a great job of sustaining the prescribed average speeds through many speed changes. As navigator, I misinterpreted a few instructions and got us lost twice (argh!). We ended up finishing 19th in our class of 54 — but we passed the most important rally test with flying colors, as we were still speaking to each other at the end! Here you see our car at a checkpoint where we were getting our timing slip. A couple of days later we ran the gimmick rally. At this event we were given “you-won’t-get-lost” route instructions and a list of questions about places along the way. 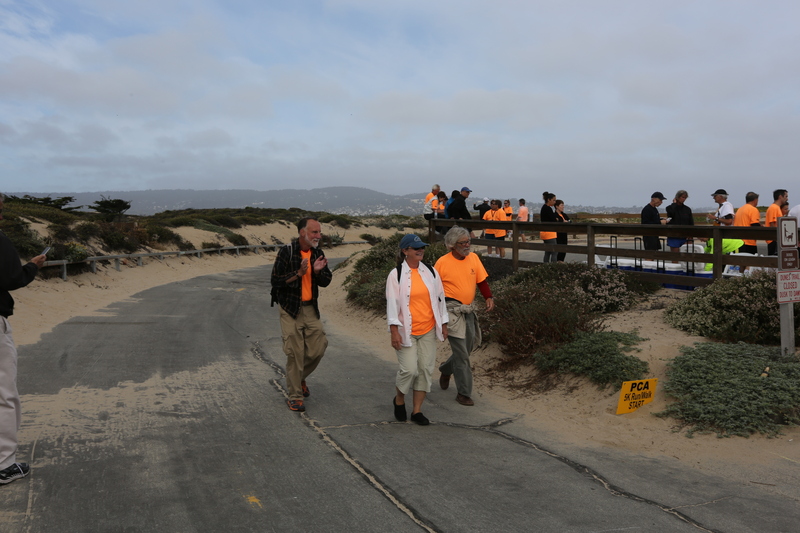 The rally route took us through 17 Mile Drive. We spent more time gaping at the scenery than we did looking for answers, so we finished well back in the pack. A rally highlight for us was stopping to admire a Frank Lloyd Wright house. My late husband had fallen in love with this house years ago, which led to his interest in modern architecture, then led to my interest, then led to my doing to a lot of research on architectural theory that found its way into my dissertation — and finally brought me to meeting an architect (CFL) and answering his question about my architectural preferences with the statement “mid-century modern architecture.” Apparently that was the right answer! Hence this house (which CFL also knows well) was a big deal for us to see together. You just never know where the road of life will take you! 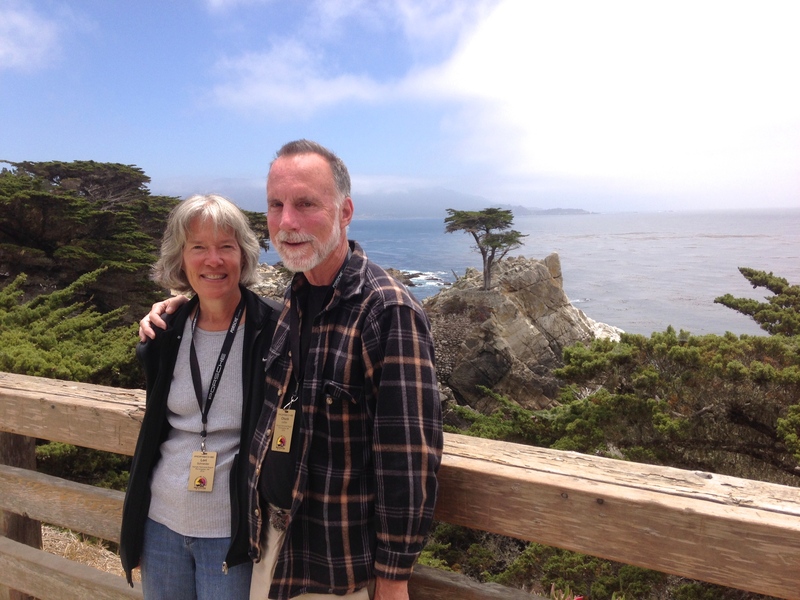 Of course we got the obligatory photo of ourselves at the Lone Cypress. 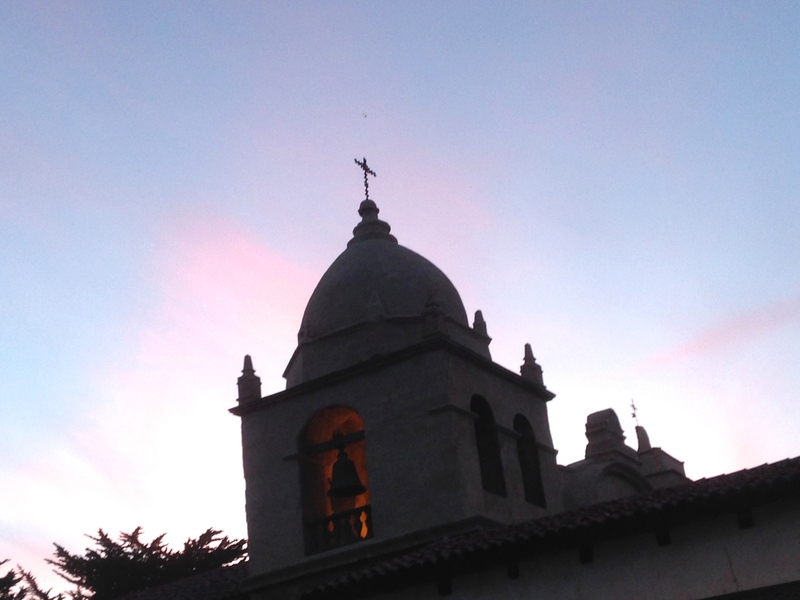 The rally banquet was held at the beautiful Carmel Mission. I enjoyed photographing the mission in the changing evening light. 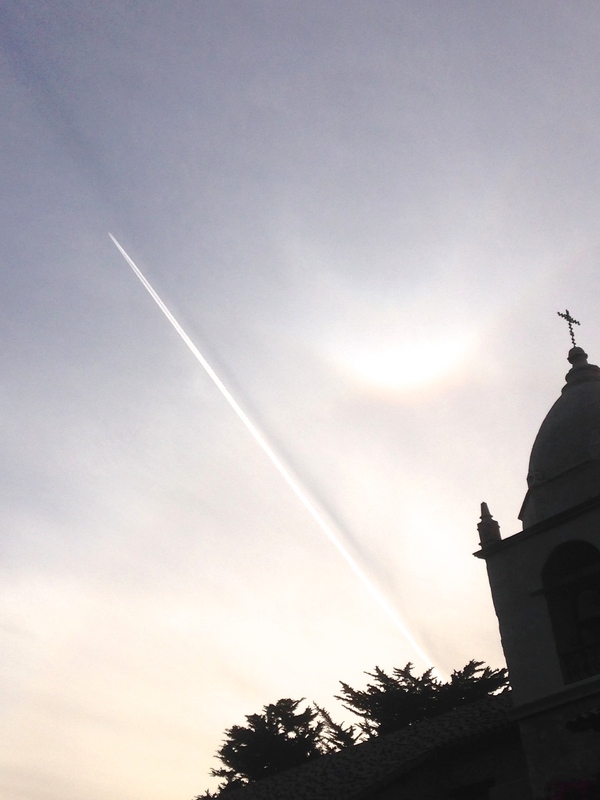 Check out the shadow that this contrail left on the clouds just before sunset! At the banquet I won a large, bulky door prize (a car wash bucket with what looks like a lifetime supply of various cleaning supplies and equipment), which meant that we’d have to ship some things home to make room in the car for the beer that we planned to buy on the way home. But I’ll save the beer stories for another post. On the last morning, we were up very early to run (me) and walk (CFL) the 5K. The route took us out and back along the waterfront. I ran a 29:12 and finished 2nd in my age group. CFL was much more laid back and finished in something like 46 minutes. We both enjoyed the event. 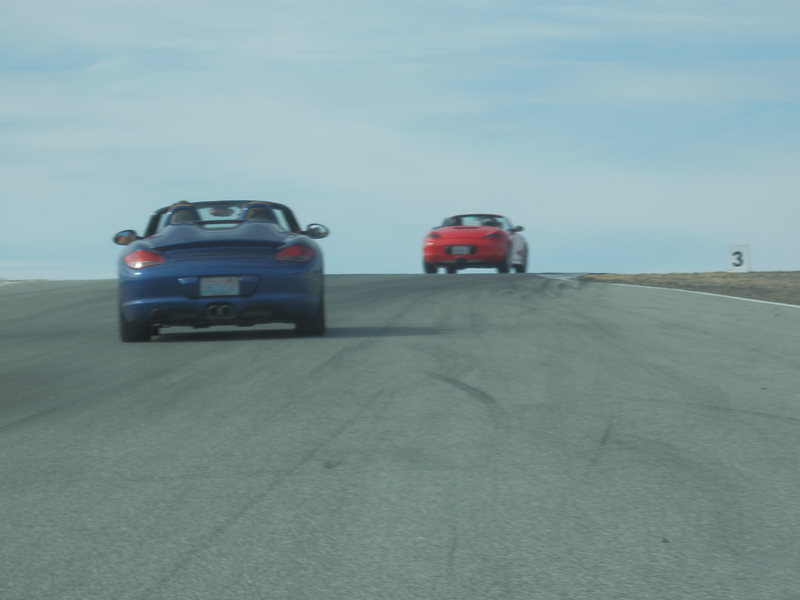 The last thing before the final banquet was the actual Parade of Porsches. 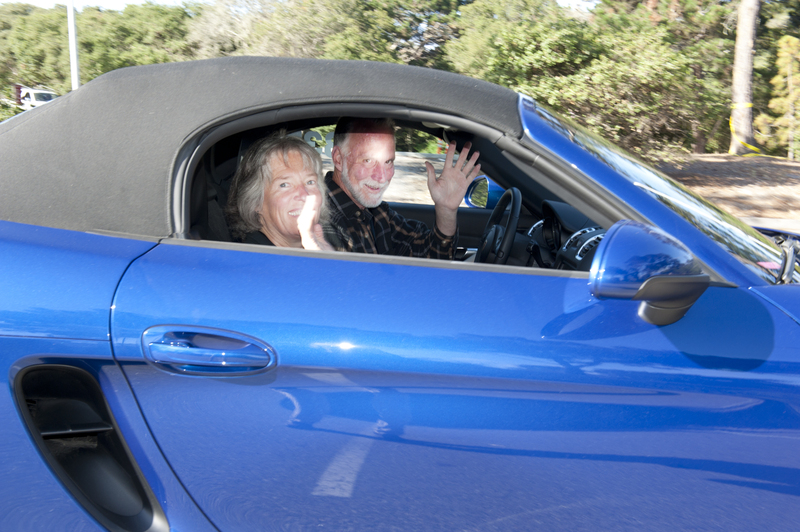 As Monterey is home to the Laguna Seca race track, this year’s parade consisted of two parade laps on the track. I consider my high-speed track days to be far behind me, but CFL had never driven on a racetrack, so I let him drive. With over 500 Porsches on the track (in 4-5 run groups) the speed was restrained, but we still managed to feel some G-forces and the unique thrill of the Corkscrew. CFL was a happy guy afterwards. The Parade concluded with the final banquet and many fond goodbyes. The next morning we scurried around and shoehorned everything into the car just well enough to make our way to a UPS store. We’d take another week to make our way home, but I’ve done enough writing for now. 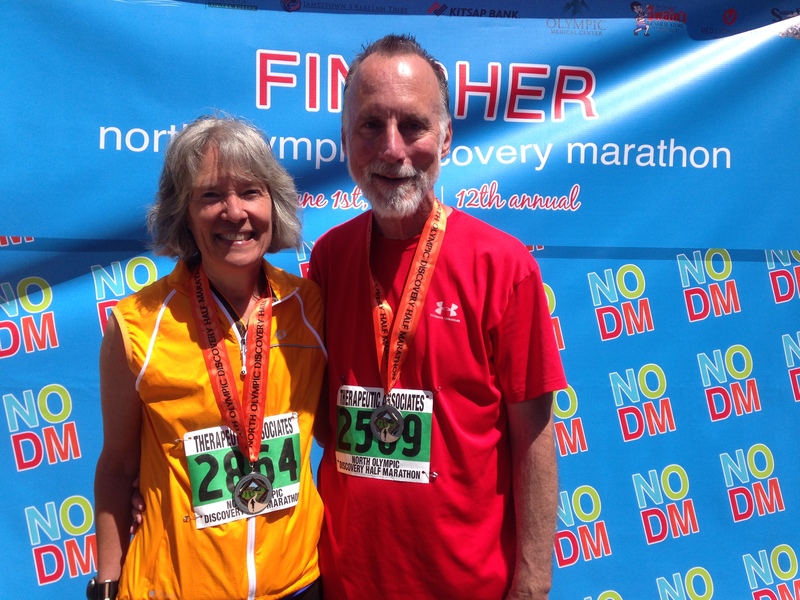 Sometimes a race report becomes a litany of facts and figures, pacing strategies and splits. When I write a race report, I’m usually still caught up in my race day mental state. I actually do math problems in my head as I run, especially in the later miles when I’m trying to figure out when I’ll finish and wondering whether I can push a little harder and achieve a goal… or if I can’t do that, then how little can I miss it by? The numbers are important to me, I won’t deny that. But a few days after a race, when I’ve had some time to reflect on it and form lasting memories of it, other things come to the fore. Richer, less quantifiable, more embodied impressions of the event and its meaning. About two weeks before the race, the mile markers went down on the pavement. On one of my daily walks I stopped to photograph several of them. Of course it was this one that I most looked forward to seeing on race day. That’s mile marker 13 of the half marathon (and incidentally mile 3 of the 5K that would finish at the same location). Only one-tenth of a mile to go from here! 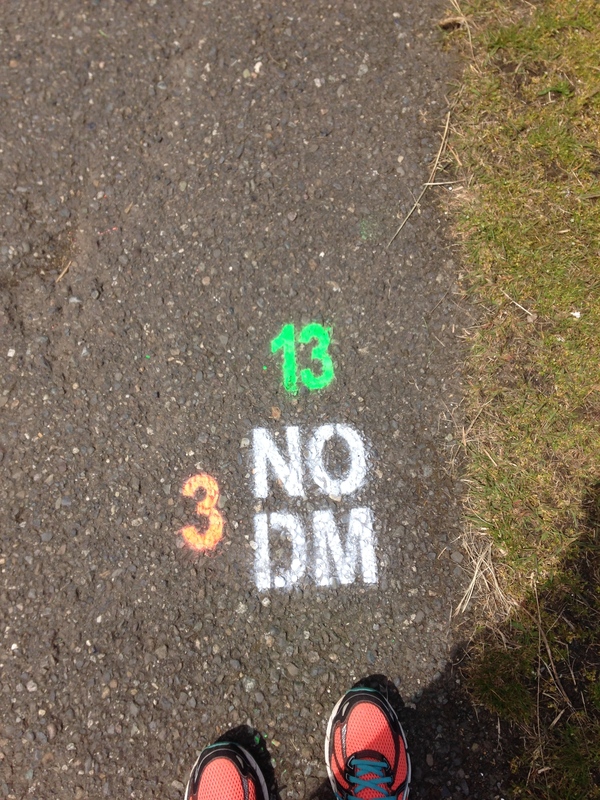 Those markers will linger on the pavement for months ahead, and I’ll smile each time I see one. At walking speed I’ve seen some wonderful things on the trail over the past two months. Sometimes I just have to stop at Morse Creek to look for eagles in the trees. I’ve seen as many as four at a time in this one location, one of several places along the trail where eagles are a frequent sight. Do you see him/her? This has been a wonderful year for our local wild rose species, the Nootka rose. 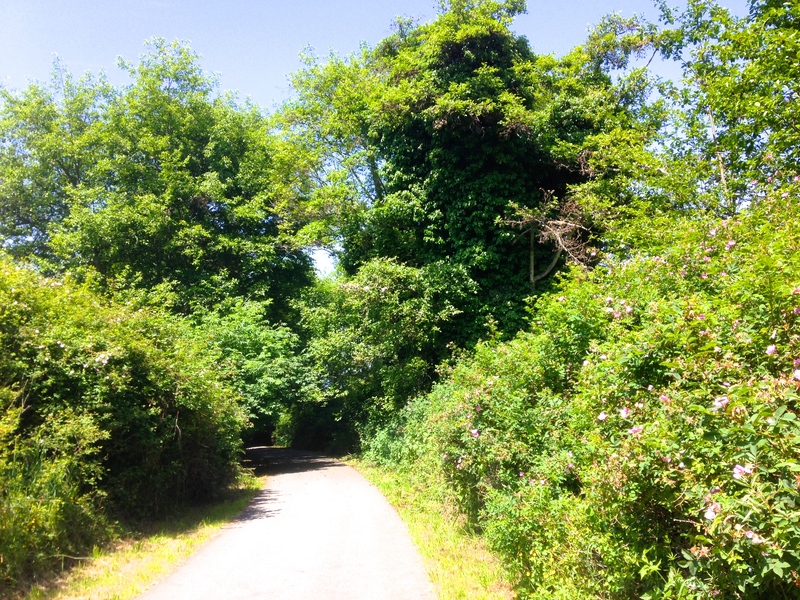 On race day some parts of the trail were lined on both sides with 10-foot tall rose bushes. Their fragrance was intoxicating. I was happy to back off the race pace just a bit here to enjoy them! Of course, at the end there is a finish line. This year the finish line looked a little different to me, however. This time there was no special someone waiting for me there. I have no finish line photos of myself. Instead, I ran with a good friend, received my medal from her mom, and accepted cool drinks, food, and congratulations from other familiar faces. Then it was time for me to hurry back to the finish line and wait for CFL to arrive! This time I got to be the one cheering and shooting photos of his arrival. He was a very happy guy. I was thrilled to pose with him for the iconic medal shot! Afterwards, of course, there was beer. There was putting our feet up and enjoying the sunshine. We spoke with runners from faraway places. One young couple had come from Munich! There were others from Indiana, Colorado, and Alaska, and other places. We relished their compliments about our beautiful corner of the world, and we shared a few tips about special places they should see before leaving. In the end, it’s about much more than the numbers at the finish line. It’s about loving the journey, every step of the way. Yesterday, 50 days after I broke my arm, my doctor gave me the okay to start running again. 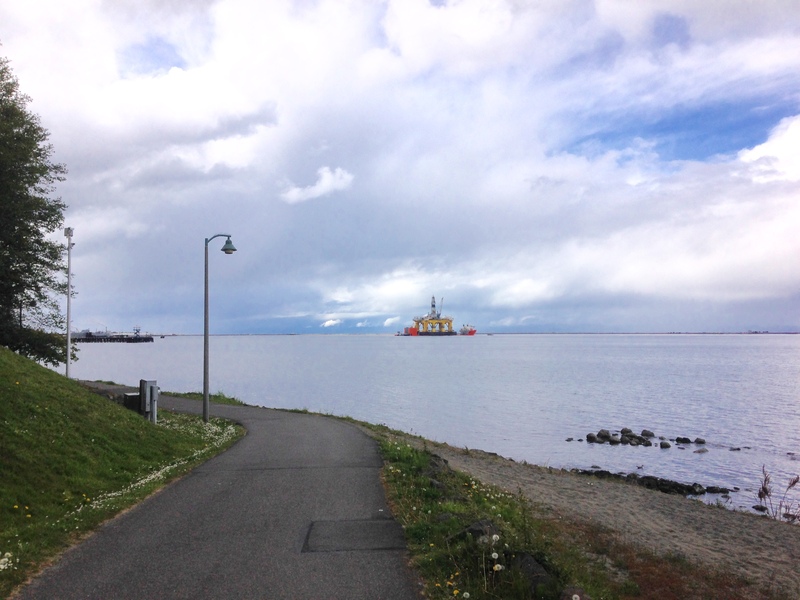 As usual, I walked home from the appointment, taking the long way home via the waterfront trail. I hadn’t walked more than half a mile when I was seized with the desire to run right then and there. It didn’t matter that I was wearing jeans, an old tired pair of shoes, and a warm jacket! I must have looked silly out there shuffling along dressed like that, like someone trying to run for the very first time. I didn’t care. The first few steps were great! Then my legs suddenly felt like they weighed 500 pounds apiece. Never mind that I have walked, on average, more than 8 miles every day since my injury. I learned yesterday that running and walking use different muscles, and that my running muscles are now seriously out of shape. I managed to run 1.1 slow miles before having to take a walk break. I ran/walked a total of 2.25 miles back to City Pier, and then walked a bit more slowly home from there. It is simply wonderful to run again! I’ll get the endurance back, I know. Today I’m taking it easy, but tomorrow I’ll go out and try to run a little longer, a little stronger. Meanwhile my slow progress with physical therapy has been frustrating and at times depressing, but I can see improvement day by day. I have almost all of my passive range of motion back, and I’m beginning to work on reaching, lifting, and regaining strength. I go through a series of exercises that takes me about 45 minutes, twice a day, and I look for other chances to work that arm throughout the day. I had a DEXA scan for osteoporosis, and I was pleased to learn that my hips are in rather great shape for my age (thanks to the running). I do have osteopenia in my spine, but it’s toward the low end (-1.6) of the osteopenia range and a long ways short of osteoporosis. My doctor believes that — given my risk factors –if I hadn’t started running five years ago I would definitely be osteoporotic in my spine by now. Everything that I have learned about bone health and healthy aging over the past 50 days has strengthened my commitment to engage in some sort of physical activity every single day. Where the body is concerned, it’s definitely “use it or lose it.” The great thing is that I have so much fun being active that “using it” is its own reward. Gaining a healthy body and the prospect of a long healthy life are bonuses! I’m still a few weeks away from riding my bicycle, but I’m headed in the right direction. Given that I had only just started to feel comfortable on my new road bike, I will need to know that my arm is strong and dependable before I reach way out there to those handlebars. Those exercises I’m doing every day will get me there eventually! For now, I’m excited about returning to regular running, but I know better than to try to do too much too soon. I’ll resume my pattern of running about three days a week and very gradually work on increasing the distance and speed. I will walk most of the North Olympic Discovery half marathon (a week from tomorrow) as I’d planned. My running goal right now is to be able to run, without walking, the entire 5K that I’m registered to run on June 21. One step at a time! If you trip on a rock, try to regain your balance. If you can’t regain your balance, try to fall gracefully. If you go down too fast and hard to fall gracefully, then take your lumps, get yourself up, start running again, and finish the last 0.7 miles of your otherwise-awesome 11 mile trail run. Then get yourself to the emergency room. If you follow my running blog, Slow Happy Runner, you’ll know by now that a few days ago I tripped over a rock while trail running and wound up breaking my left arm just below the shoulder. No running or cycling for me for at least 4-6 weeks. 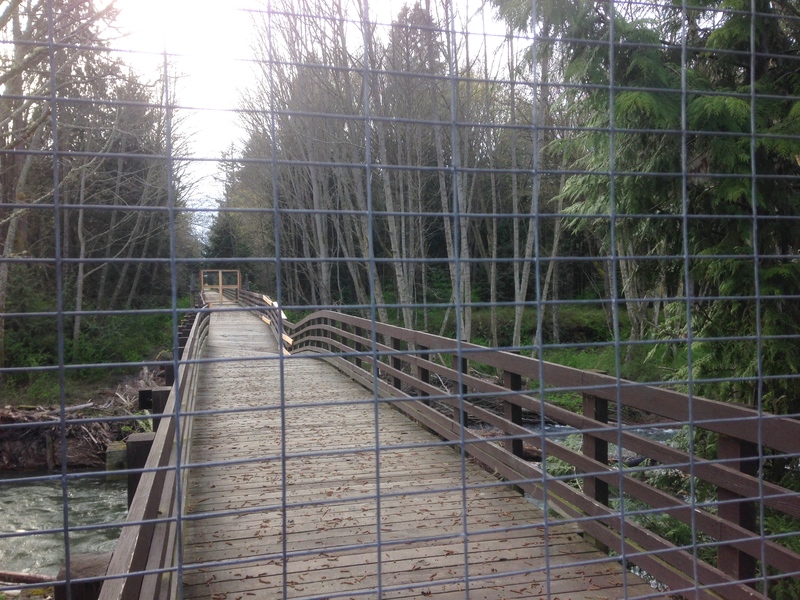 Therefore no OAT Run trail half marathon on April 26, no Bikes and Brews group ride in Seattle on May 3. Even my local North Olympic Discovery half marathon on June 1 is looking iffy. I’ll know more about the recovery prognosis and timeframe when I see the orthopedist tomorrow, but the writing on the wall is pretty clear. My priority now is to heal both quickly and well. As a lefty, I shudder at the thought of not regaining full use of my left arm. Once the bone has healed, I’ll want physical therapy and lots of it! My right arm is trembling right now from the unaccustomed effort of pecking out letters on the keyboard one by one. Trying to feed myself is a chore. Cooking is nearly impossible. Brewing a batch of beer is out of the question. I’m committed to continuing my activity streak, which is now at 461 days. I’m still walking daily, although it’s surprisingly difficult to walk several miles, even on a flat paved surface, while focusing on keeping one arm absolutely still in its sling. Perhaps the toughest part was looking at all the gaps in my calendar after I removed all my planned training runs, bike rides, and brew days. I caught myself this morning wondering why I should bother getting out of bed if I couldn’t run, hike, ride, or brew. I don’t like thinking thoughts like that! So I know I’ll have to watch my attitude. I still have LOTS of reasons to get out of bed! It’s crucial that I find a way to feel happy in the midst of all of this. On my walk today I made a point of looking for things that I don’t always have time to see when I’m running or riding. The salmonberries are starting to bloom. So is the evil, invasive, but undeniably beautiful Scotch Broom. Small black-and-white butterflies are suddenly everywhere. 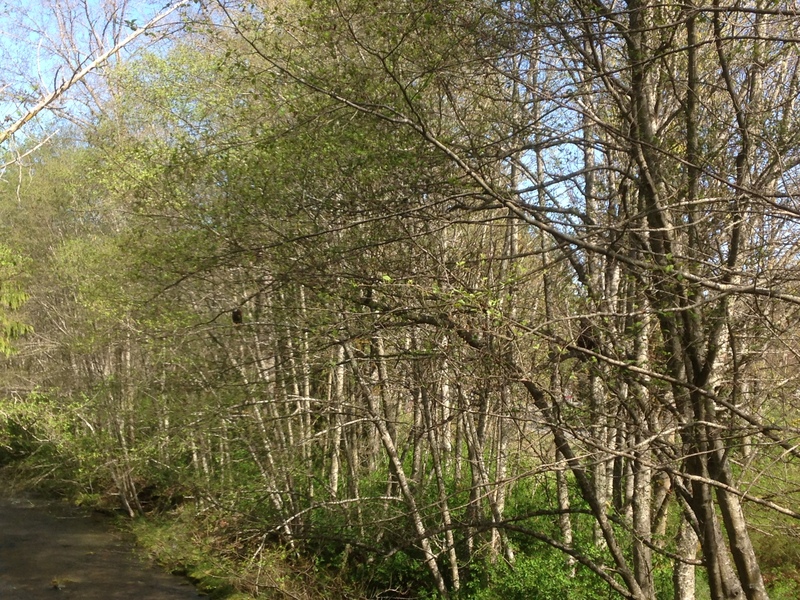 Parents and small children are out on the trail enjoying slow, wobbly bike rides. 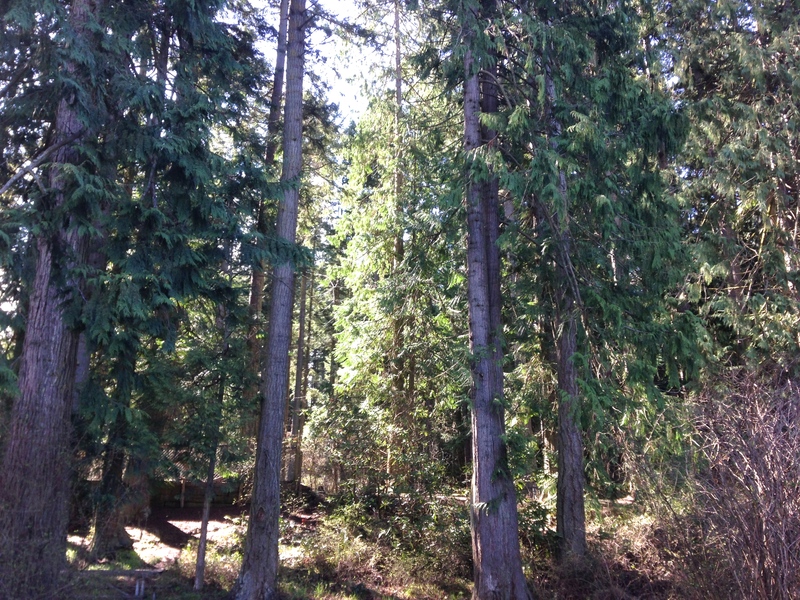 Spring has finally reached the Pacific Northwest! Maybe I’ll make one simple practice — slowing down to observe — the focus of my coming days and weeks. This setback is temporary; meanwhile I still have my health and my desire to make the most of each day. What did you do with this precious day of your life? And what will you do tomorrow? 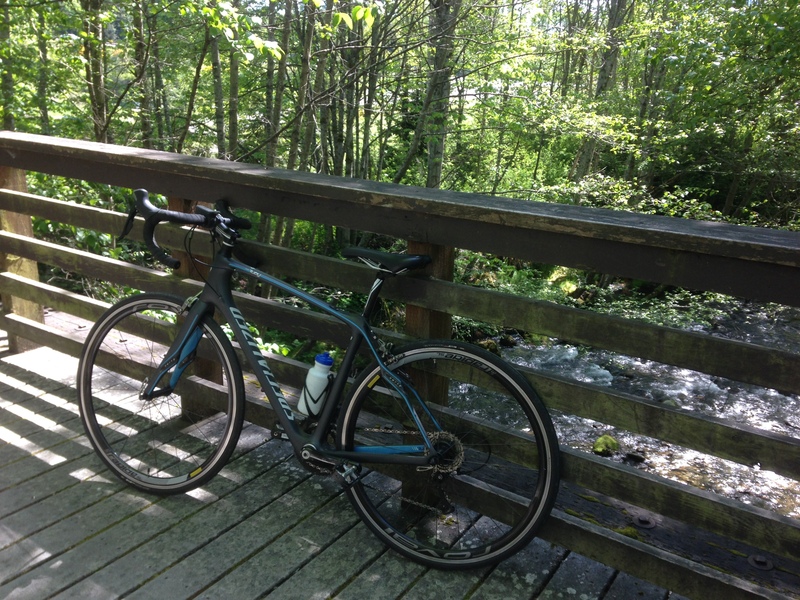 As I was riding my bicycle today, it occurred to me that I do almost all of my running, and a fair percentage of my cycling and hiking, as a solo activity. CFL doesn’t run at all. We do try to bike and hike together, but often he’s working on a project with a deadline just as I’m itching to get out the door. This week, CFL is far away attending the funeral of a family member, so I’ve been busily entertaining myself with some big and audacious activities. At first I wasn’t sure whether I wanted to be described as an animal, but at some point I decided to embrace the concept. I am an animal. A big part of the endorphin rush is that feeling of becoming attuned to my body and reveling in the things that my body can do. 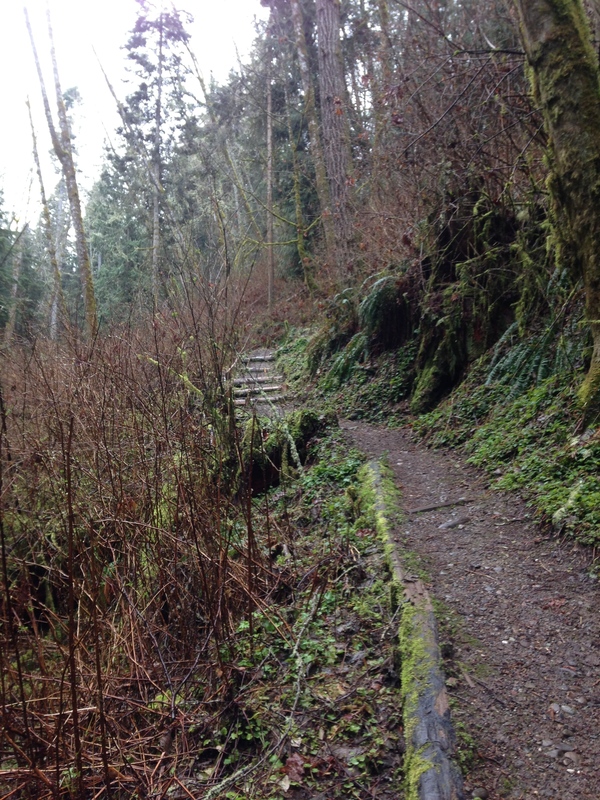 Yesterday I ran 7+ miles of steep roads and muddy, even steeper trails. There is something magical about trail running that really brings out the animal in me. I bound along, sailing over rocks and roots. I giggle when I get my feet wet sloshing through mud puddles. My eyes and ears tune into the sights and sounds of the forest — this varied thrush, that raven, that mysterious swish of an unknown and unseen creature, those big tree limbs overhead creaking in the breeze. As I ran, I thought to myself: this is a feral activity — and I am feral. When I run trails, I generally don’t set ambitious pace goals for myself. I’m out there to have fun and enjoy the beauties around me. Therefore I had no qualms about stopping to take a few photos. Tell me — would you want to hurry through places like these? 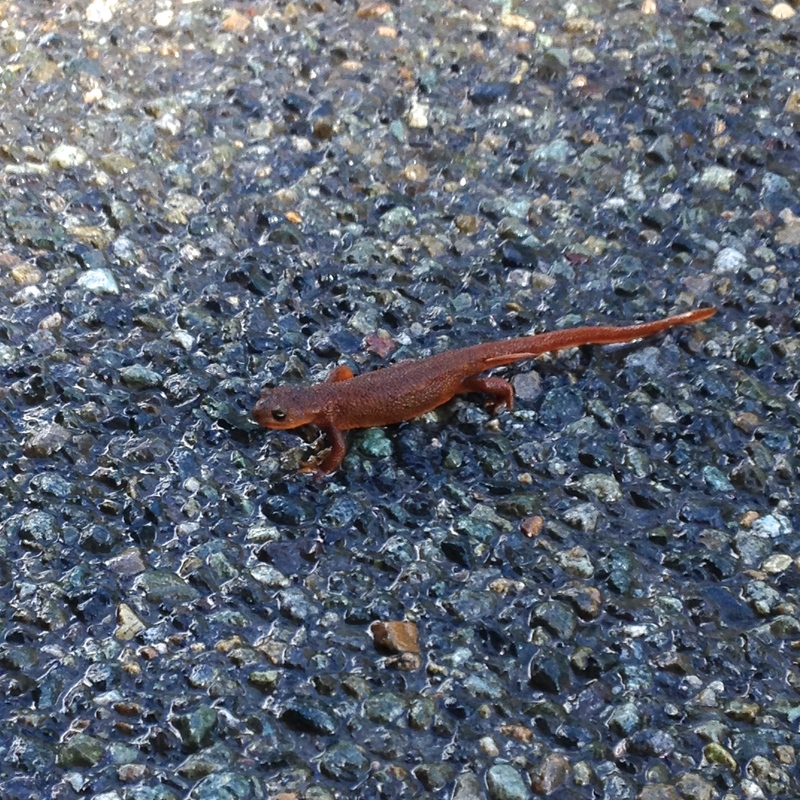 The little guy in the next photo is a rough-skinned newt. He’s cute, but don’t mess with him. He’s highly poisonous. The only creatures that can eat a rough-skinned newt and survive are some populations of garter snake, and only because they have evolved resistance to newt toxin. In response, the newts have become more and more toxic. It’s a classic case of co-evolution. So that was yesterday. Today, however, putting aside the charms of stopping to view rough-skinned newts and other trail delights, I set out with an ambitious and very specific goal. I was going to ride my bike 17.5 miles east on the Olympic Discovery Trail, and then I was going to turn around and ride back. 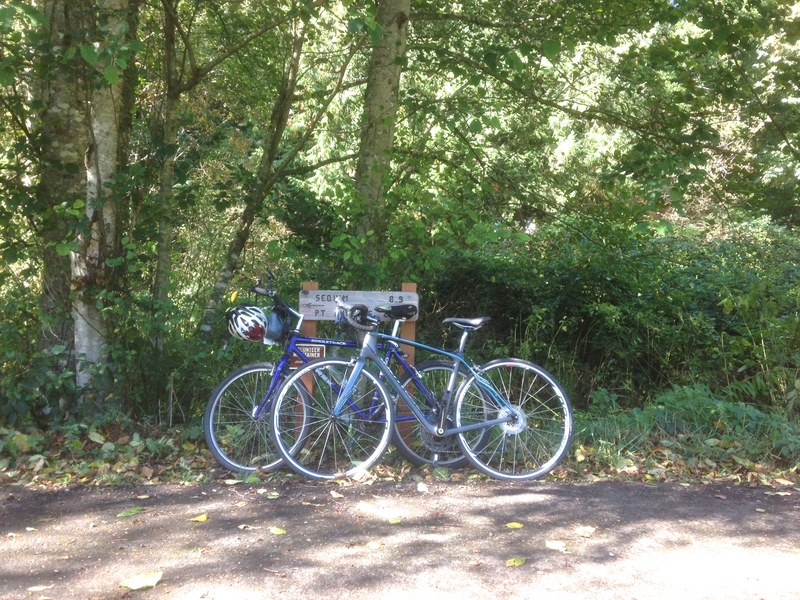 My longest bike ride to date had been the Portland Bridge Pedal last summer at 33 miles. I was going to beat that distance, and I was going to do it as quickly as possible. Now, let’s think about this for a minute. I’m a female in my late 50s. My boyfriend is 1,200 miles away, literally graveside at the moment I’m starting my ride. My jumping-off point is a trailhead on a dead-end road about seven miles east of downtown. I’m going to ride on a “rails-to-trails” biking/running/walking trail that, for the most part, stays well away from well-traveled roads. In the dozen years I’ve lived here, there has been only one attack on a lone female on the trail — she escaped successfully and the guy was caught. Still, I’ve seen all kinds of things on that trail. I’ve witnessed a moving domestic dispute: the girl bleeding, running after the guy and shouting, “Why did you hit me? Why are you leaving me?” I’ve watched the local police trying to lasso a runaway ram in a chase scene reminiscent of the Keystone Kops. Just a couple of weeks ago, I rescued a black Lab that some idiot had left chained in the back of a truck. The dog had jumped over the side and was hanging itself. I saved the dog’s life. So I’m not kidding when I say, you don’t know what you might encounter on the trail. It takes a certain amount of guts just to go out there alone. I do it because I’m fit, I’m quick, I stay alert, and I will not let fear rule my life. I do it because I know I can do it. So I got on my bike and off I went! On my eastbound leg I rode almost non-stop, pausing only at street crossings in Sequim. 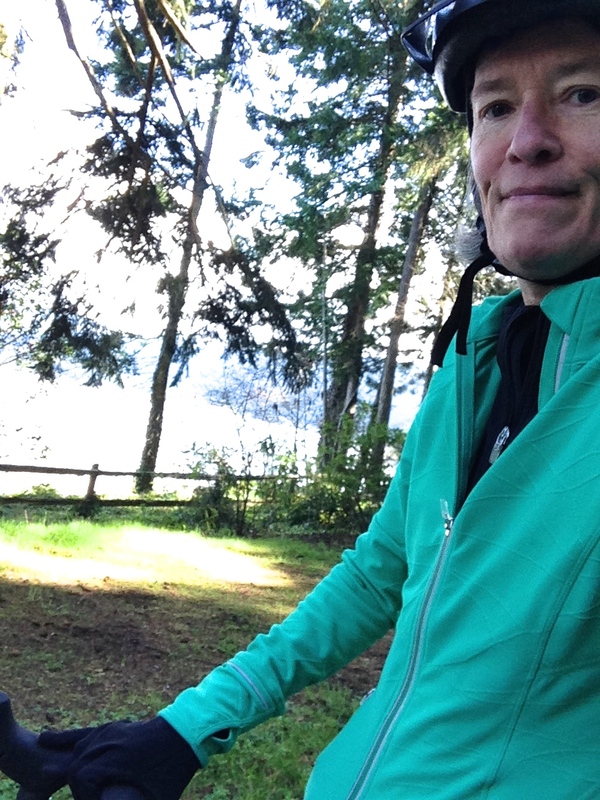 I flew along, barreling up and down the hills (aided a bit by what felt like a slight tail wind), all the way to my turnaround point at Sequim Bay State Park. Here I stopped to eat a small snack, text CFL, and take a couple of photos. Awash in endorphins, I started back. And immediately hit the headwind! For 17.5 miles I battled a 15 MPH headwind. I even dropped my hands down and fully utilized my drop handlebars in an effort to be more aerodynamic. It didn’t help all that much, but I felt ever so athletic. I thought I’d get a break from the wind in the last couple of miles, which are hilly but heavily wooded. But it was windy there too. Windy and hilly. It took me about ten minutes longer to come all the way back than it had taken to go out, and I was really tired when I finished. But I never, not even for one moment, doubted my ability to do it. I rode my bike 35.23 miles solo, and I completed the ride in just a tick over 3 hours — my longest and fastest bike ride ever. One of my favorite theories (don’t we all have a favorite theory?) is Albert Bandura’s theory of self-efficacy. Bandura defined self-efficacy as “one’s belief in one’s ability to succeed in specific situations.” It’s that sense of “I can” that empowers us when we dare to set big hairy audacious goals and then dare to achieve them. There’s a lot more to the theory, but that’s the gist. Because I have self-efficacy, I can decide to train for a marathon, and then go out and train for it, and then run it. I occurred to me, as I was riding into the headwind today, that there is a connection between self-efficacy and experiencing myself as feral. Please bear with me for a couple hundred more words while I try to tease out this connection. Last month I celebrated my second anniversary of becoming “post-corporate” — okay, I’ll say the word “retirement.” I truly feel that it’s taken all of two years to fully detox from corporate life. When I finished my undergrad at UCLA lo these many years ago, I jumped into corporate life with the feeling that I would do great things and be amply rewarded for them. For the first few years, that was true. Then I married, had a child, took on a mortgage and a couple of car payments. Suddenly the stakes were higher — I needed my job and I couldn’t afford to screw up. I became cautious. I did whatever I had to do to get by and not much more than that. I lost the fire. I lost my sense of self-efficacy. In the two years since I left the corporate world, I have had to re-learn how to relax. How to take deep abdominal breaths. How to sleep for as long as I need to sleep. How to fully live each day, wring it to exhaustion and deep satisfaction, and then let it go in anticipation of the next day. How to be feral. I have let go of all that toxicity. I am no longer a garter snake facing down a rough-skinned newt and hoping I’m resistant enough to survive. I have come back to that more-innocent animal that I once must have been. I am fit, I am feral, and I know that I can do the things I set out to do. Oh, and I’m still a bit bashful about taking “selfies” — but here I am anyway. I can’t wait to see what tomorrow will bring!